“Where’s My Cash?! Testimony of a Money-Chaser” shares over 20 years of in-the-trenches experience in commercial receivables. A/R expert Stu Woolley provides 86 minichapters of wit, wisdom and advice about the policies, procedures and attitudes that constitute best practices in the supervision of past due accounts, credit management, dispute resolution and much more. “Where’s My Cash? !” reveals why accounts receivable management matters to your profit-seeking business and offers step-by-step counsel on how to get paid, retain good customers and mitigate bad debt risk in an SME environment. Available for purchase at Amazon here. Download the first three chapters of Where’s my Cash?! here. Where’s My Cash?! is a cautionary tale for any business that delivers a service or a product first and waits in limbo for payments that may never arrive. Where’s My Cash? !” should be required reading for business school graduates and entrepreneurs alike. Cash in, cash out; this is the lexicon of the entrepreneur. Where’s My Cash?! is the primer you need to nurture and utilize this critical resource. If the question “where’s my cash?” occupies your mind because it’s having a negative impact on your business, then you’re now holding the right guide to best cash practices. As Stu Woolley points out, it’s time to rethink the whole approach to receivables, set priorities right and put a plan into action. Get out a highlighter and key-point your way to a workable A/R program. When I agreed to preview Where’s My Cash? !, I scarcely anticipated the exuberance of the writing, let alone so many thoughtful insights into how human nature confounds our best intentions to manage risk, receivables and cash flow effectively. 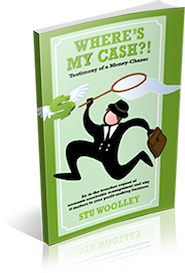 Stu Woolley is a great champion for becoming cash conscious, and this book is a bracing refresher, blending practical tips born of long experience with the philosophy of a coach. — Robert A. Wood, President & CEO, 8020Info Inc. In any business, your chief assets are money and time, especially the time of your talented staff. If you’re spending endless employee hours trying to collect from overdue customers, then those hours aren’t being spent growing your business. If you’re also having operating funds challenges, then you need a better system for managing receivables and cash flow. Where’s My Cash?! cuts to the heart of the issues that can keep you awake at night and shows you how to get your A/R under control and improve profit. — Phil Hood, President, Enter Music Publishing, Inc., Publisher, DRUM! Where’s My Cash?! is a must-read for every owner or manager of a small to medium sized business. It clearly identifies why lack of cash is the critical factor that limits the growth of these companies and highlights how that same lack of cash is the main reason for failure. In addition, Stu Woolley describes organizational and operational fixes that will turn accounts receivable into cash. This is an easy read that will deliver measurable benefits to your organization. A must-read for any business owner who wants to get paid! Where’s My Cash?! explains how to manage receivables in a systematic, practical way. Stu Woolley’s writing style is easy-to-read, educational and entertaining. Apply his advice and the cash will start to flow.